ST. AUGUSTINE, Fla. -- Witness testimony from inside an upscale St. Augustine home that became a murder scene is shedding new light on a shooting rampage that killed two women last month. Rachel Hendricks and Lamar Douberly were at a Bellagio Drive home when investigators allege James Terry Colley Jr., 35, of St. Augustine, burst inside with a handgun Aug. 27 before shooting his estranged wife, Amanda Colley, 36, and her friend, Lindy Dobbins, 39, court papers show. Colley Jr. was arrested later that night in Norton, Va. on a DUI charge after a massive manhunt. He was indicted Sept. 4 on two counts of first-degree murder, two counts of attempted first-degree murder, burglary with assault or battery, burglary to a dwelling and aggravated stalking after injunction. Colley's being held without bond. He's due in court Sept. 28. About 10:30 a.m., the suspect emerged from a wooded path behind the home armed with a handgun before opening fire through the rear sliding glass doors near where Hendricks and Douberly were standing, Hendricks told investigators. Hendricks and Dobbins hid inside a closet when Colley Jr. came inside, while Amanda Colley hid in a bathroom, according to Hendricks' statement. Hendricks was barricading the closet door with her body as the suspect searched the home for Douberly, yelling, "Where is he?" Hendricks recalled. Hendricks told Colley Jr. that Douberly wasn't in the closet, that it was just she and Dobbins inside, she told investigators. Then, according to the statement, Colley Jr. shot through the closet door, narrowly missing Hendricks. When Colley entered the closet and allegedly started shooting Dobbins, Hendricks fled the home and called 911. Court papers suggest Douberly ran from the home after the initial gunshots. 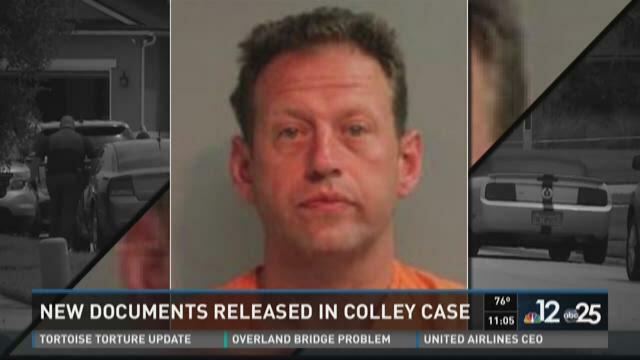 The suspect's father, James Colley Sr., told deputies afterward that his son had just called him, saying that he had shot his wife and his wife's friend, according to a sworn statement. Colley Jr. was "furious" after a court hearing earlier that morning, said his father, who had told him "not to do anything foolish." Hours earlier, the suspect had pleaded no contest to violating an injunction for protection against violence his wife had taken out against him, court records show. That's after Amanda Colley had sought and received a temporary injunction for protection against violence against her husband July 13 after he burned all of her clothing the day before, court records show. Weeks later on July 30, Colley Jr. was arrested for violating that restraining order after repeatedly calling and texting Amanda, driving by her place of work and going inside her home when she wasn't there. On Aug. 10, Amanda Colley got a permanent injunction against her husband, which also ordered him to complete a batterers intervention course and surrender his firearms.